Cleaning up the engine bay had always been left to either shiny chrome parts, painted engine components, and pulley kits. But hoses and hose clamps were usually left alone because there wasn’t any way to make a black rubber hose and a stainless hose clamp look as good as the rest of the fancy upgrades. A few companies tried reinventing the clamp, but it was still a metal clamp that just didn’t cut it or help make the hose ends look as good as the rest of the engine compartment. For radiator hoses, let’s be honest here: stainless or painted convoluted hoses only look really good in pictures. If you’ve ever tried to install them yourself you probably know that they aren’t all that great; they don’t fit very well, and they are prone to leaks if you don’t clamp them properly. The anodized hose ends look pretty cool – in pictures as well – but once the hose clamps are tightened those ends are not very snug. You can replace larger hoses with stainless braided hoses, but that gets costly and still leaves the smaller vacuum lines uncovered. There’s nothing worse than having a highly detailed engine with chrome, painted and anodized parts, and then seeing your blotchy hoses ruin the look. No matter what you do to your engine and engine compartment, nothing is going to make your hoses and connections look good unless you dress them up a little bit. Some people like the silicone hose kits, but they’re not made for every vehicle. Still, others like the look of braided stainless hose coverings, but after a while they can discolor a little and get dirty, and they never come clean again no matter how much you try. The price of stainless steel braided hoses can get up there in a hurry, especially when you add in the fittings and adapters. We’re talking several hundreds of dollars for all the hoses and fittings – and that’s for just one car. Finally there’s a product that addresses the ugly hoses without taking you to the bank in the process. This new product is called Hose Candy, and it was developed by Oomph Labs. Hose Candy consists of Hose Skins in various sizes and colors to coordinate with your engine, or to contrast it. It also includes Sidewinders, connections for smaller fittings like vacuum lines, Boa Clamps to seal up the ends of your larger hoses, and Super Shrink hose ends in various color to brighten things up. Hose Candy’s Sidewinders have barbed hose ends that twist-lock together to make a quick-connect fitting. This set up works great with vacuum lines on vacuum controls, carburetors and turbos, and it’s simple to put together. The pay off is a job that looks very professional, which you can easily do yourself. When you need to remove a component, the twist-lock connectors allow you to disconnect the hoses and reconnect them later when you’re done. No more broken or stretched vacuum lines causing you to make an unplanned trip to the auto parts store. The fittings also make it easy to add a ‘T’ in line so you can temporarily hook it up to a gauge or test equipment. For the larger hoses, Hose Skins are available to slip over your existing rubber hoses and give them a cool look. There are a few grades available for different temperature ranges, from up to 465 degrees for the Diamond Back Black Hose Skin or the Dragon Skin which will work with temps up to 1,200 degrees. 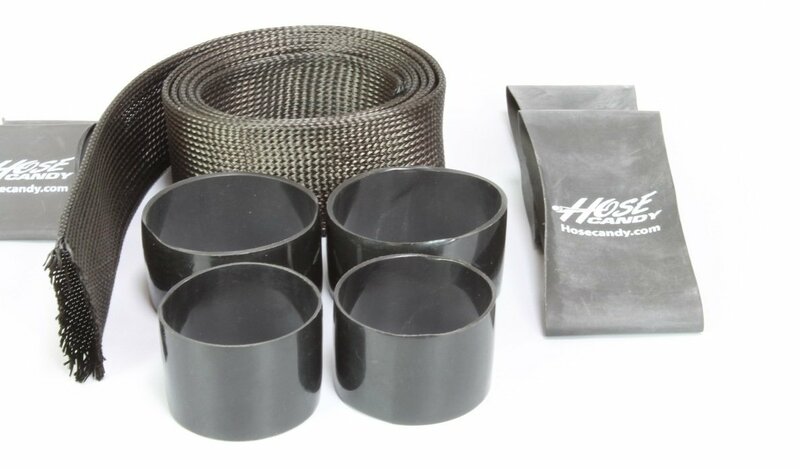 The Carbon Fiber Hose Skin is available in a variety of colors, and will also protect your hoses and look great, while resisting engine fluids and solvents. For wrapping up the ends of your Hose Skins, Hose Candy provides you with Super Shrink, heat shrinkable sleeves in many colors that will keep the hose covers tight on the end of the hose. Super Shrink can be used as decorative cover for Boa Clamps, which offer a tight fit that readjusts clamping force when your engine reaches operating temperatures. The heat sensitive thermoplastic Boa Clamps will resist coolant and other automotive fluids to keep the hose ends clamped tight, leak free, and looking great. The Boa Clamps and Super Shrink works just like any heat shrink tubing that you might use on your wire connectors. Using a heat gun, applying heat to the Boa Clamp or Super Shrink will shrink them down to form a tight seal. We borrowed a neighbors 1957 Chevrolet to install Hose Candy on a few of the hoses to update the under-hood appearance. The car is in great condition, but the radiator and heater hoses were blotchy and discolored from the temperatures they were sustaining under the hood. With all the shiny chrome parts and the painted engine components, the rubber hoses took away from the overall look. We used Hose Candy to address this issue and make those hoses complement the engine bay instead of taking away from the overall look. Unless you’re going for concours restoration points, rubber hoses and hose clamps have never been considered attractive. We removed the upper and lower radiator hoses, and both heater hoses, to cover them with carbon fiber/kevlar black Hose Skin. You must remove the hoses at both ends for this installation, and it’s a good time to inspect the hoses and replace them if they have become brittle or they are too soft. If the hoses are dirty or have a lot of oil or grease, it’s also good to clean them up if you’re not replacing them. Installation is easy, Hose Candy is simply a sleeve that fits over the end of the hose and you slide it onto the hose completely. Once you have covered the entire hose, pull both ends snug and make sure that it fits tightly on the hose. It’s very important that you don’t cut the Hose Skin prior to covering the hose. It will become shorter as you expand it to fit over a hose, and cutting it first might leave you with a piece that’s too short and unusable. When you have cut and trimmed the Hose Skin, slide a Boa Clamp over the hose and onto the fitting end of the hose. A comparison shows the improved looks when using Hose Candy. When the proper length is determined, cut off the remaining Hose Skin and with a regular pair of scissors you can trim the ends. Since you will be covering up the end with Boa Clamps, you won’t need to have any of the Hose Skin extended beyond the hose itself, so if you trim it a little shorter by about a quarter inch that will be fine. Boa Clamps also come in various sizes, so if one is too tight or too loose, go to the next size and make sure that it has room to shrink over the hose and the fitting. We used a heat gun to shrink the Boa Clamp down onto the hose end. You want to be sure not to hold the heat gun in one spot, moving it around the hose and allowing the clamp to shrink evenly. You’ll see the Boa Clamp get a shiny appearance as it shrinks, and once this happens you can tell that it’s begun to clamp down on the hose and the fitting. When the fit is tight, you’re done! No need to continue to apply heat, too much and you could damage it and have to start over. Try to go slow and steady, you will have to exercise some patience until you get the hang of it. After the Boa Clamp is secure, you can leave it as is or dress up the end with Super Shrink to add some color and detail to the hoses. It applies the same way as the Boa Clamps, but Super Shrink is thinner material than Boa Clamps and won’t need as much heat to shrink, so be sure to keep the heat gun moving and not focus on one spot so it will shrink evenly. Apply even heat completely around the fitting; too much heat in one spot will cause the Super Shrink to fit improperly. The result, after installing Hose Skins is that the hoses look just as good as the rest of the engine compartment, and give it a custom look over the boring rubber hoses. With many colors and styles available, you can go as clean and classy as you want with black Hose Skins and Super Shrink, or color coordinate all of your hoses with the color of the engine or the car itself. Many kits are available, allowing you to cover as much or as little as you want, or you can buy master kits to keep extras on hand for other vehicles. Oomph Labs has given you another way to customize under the hood, with great looks at an affordable price. At top: the before and after – from boring rubber hoses and metal clamps to Hose Candy, with Boa Clamps making a clean, secure connection. Bottom: hoses are much better looking now.